In high school, I had a falling out with comics — trying to replace my nerdy junior high obsessions of comicbooks ands rpgs and star wars with skateboarding and girls and Christianity. 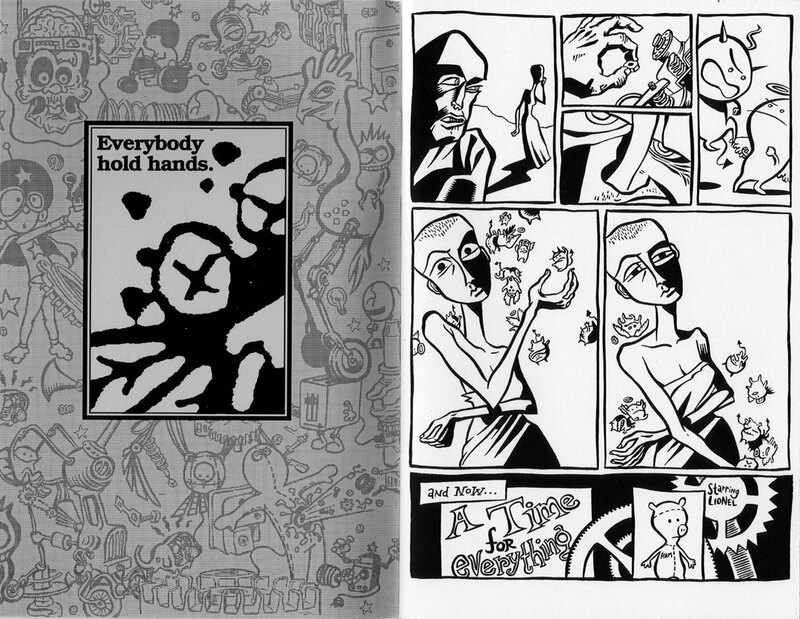 At age 16, I met Kurt Halsey at art camp – the snarkiest skater of the bunch – and he made comics cool for me again. 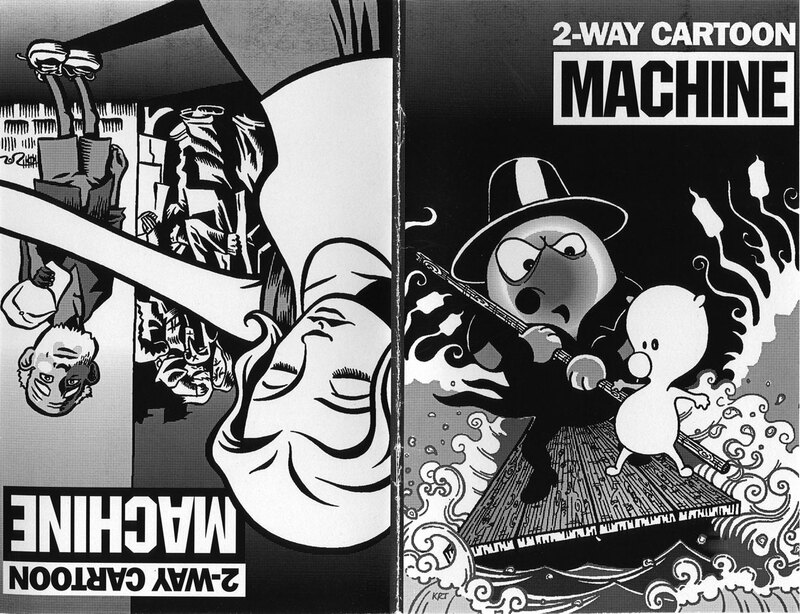 Upon graduating, Kurt and I collaborated on my first official mini-comic – TWO-WAY COMIC MACHINE – it was one of those flippy dealies, half his work / half mine. He drew my cover, I drew his. 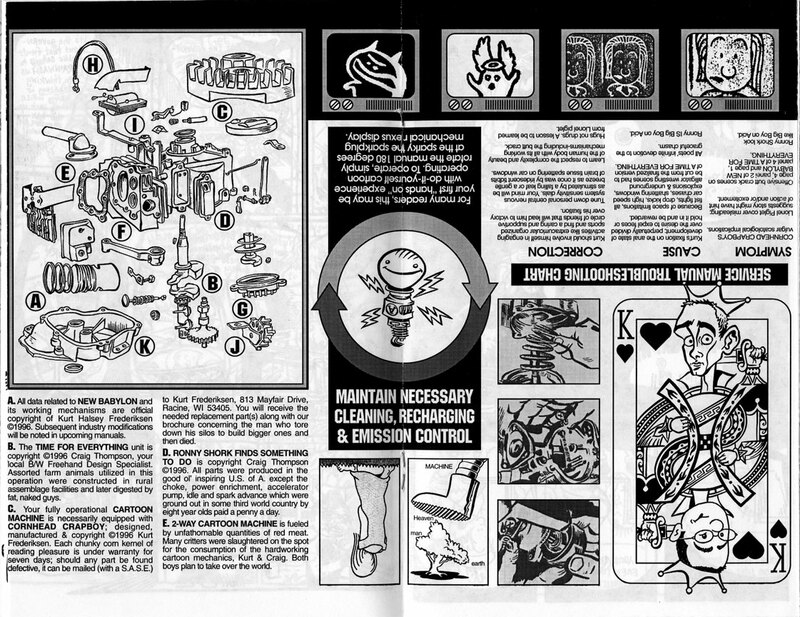 I worked at the local newspaper as a low-level ad stylist and used the small “brochure” press to print it. We couldn’t sell the things at the time … I remember driving through the streets of Milwaukee, tossing handfuls out the window — proselytizing or littering depending how you look at it. Excerpted here is the story of Lionel Piglet. The photo on the left is the oldest I could find — 1997 in Milwaukee, Wisconsin — the two of us looking respectively baggy-trousered and limp-wristed. Somewhere off Humboldt Street. At the time, I worked as a laser light show animator at Discovery World children’s museum. The second photo is just short of ten years later — the small gang that gathered to celebrate my 31st birthday — Vinh, myself, Kurt, Taizo from the nearby okonomiyaki place, and Alena displaying the amazing memoir “A Weasel in my Meatsafe”. Left picture is JUST LIKE BLANKETS!!! Um, do you mean “respectively” rather than “respectfully”? i like your sweater in that first pic. Wow that was great, thanks for sharing. Wow, I’m in high school right now (literally) and my art isn’t even that good, let’s just hope I get better, I need something to live off of. Haha. Anyways, I really liked that comic. You’re a very skilled (and one of my favorite) artist. It’s looking darn good for a first comic i’d say. 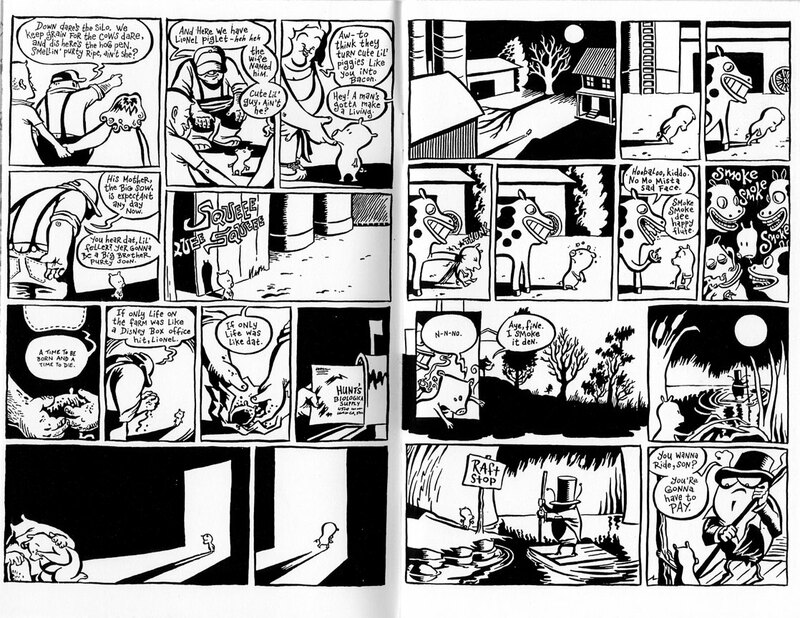 wow, its amazing how crisp your storytelling and style were right out of high school. its almost as if there’s an invisible floating dancing man you’re both watching in that picture. Great blog, Craig. It’s so lovely! Your art makes me envious. It also makes me want to write again. You are an inspiration, as corny as that is. 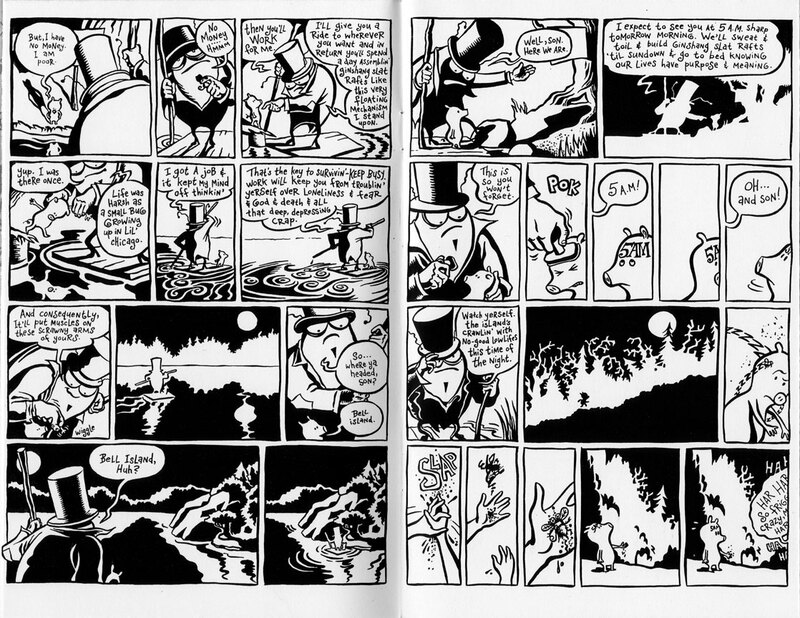 Great story, some of the panels without detail, just solid blacks or white are amazing. Quite a sad ending. I just discovered this blog and I like it. It’s a wonderful way to follow the process of creating a new book, just like we’re friends who from day to day share those experiences. Thanks, and lots of success with the new book! i just found your blog through Kurt Halsey’s livejournal community, and it makes me happy to hear about you, let alone FROM you. some funny coincidences: i just pulled down a few of your books from my shelf the other day, and flipping through them, wanted to get more graphic novels(though i’m unfortunately broke). So I looked up Top Shelf’s website and spent a good hour or so looking through the previews they have. One artist i found on there and liked a lot was Aaron Renier, so it was cool to see you wrote about him AND kurt in your blog. I was also just recently introduced to Menomena by a friend, and i’m stoked to her you did the art for their new album!! I love coincidences. Since i’ve opened my mind more to things like that, i’m realizing how everything is so connected. anyway, i’m glad i found your blog. i’ll be checking back!! It’s a wonderful thing when friends can introduce you to new things and reinvigorate your passion for things you once loved. Even better that you’ve remained friends for all these years. wow – my first job out of college was as a laser light show animator! I’ve never met anyone else who’s done that. nice. Hi Craig! Thanks for posting this beautiful little story and a preview of Habibi. 2009 sounds a little far, but good things come to those who wait, so… Happy to see you have a blog. Loved ‘Blankets’ and ‘Carnait’ but I guess you must be hearing this all the time. Sorry you were sick and missed the visit to Greece, I live here and I was really looking forward to that. Well, to the future then! wow – I just looked up “okonomiyaki” on Wikipedia earlier today. really! now I’m going to settle in and enjoy Lionel Piglet. Ach! I am now filled with self-loathing. I made my own mini comic a few months ago, but my linework isn’t as nice as yours. What tools do you draw with? I love your brushwork (?). hi…i just want to ask, do you still believe in God and Jesus? or did ur faith kind of drifted away? i have only read goodbye chunky rice and blankets and i gotta say…you work is beautiful and it touched me. where did you and kurt meet each other? when i read two utterly separate books but i have a daydream about the characters hopping out and crossing into each other’s world.. If I weren’t 7 years old in 1997 I would ask you for a date.